E28 Alternator? Anyone running one? I may replace my alternator before track in July. Someone suggested the E28 version for the solid mount ears without bushings. Anyone running one? It's still 90A. I don't need more than 90A. Thoughts are too much unnecessary drag with the 150A BNR alternators on ebay. 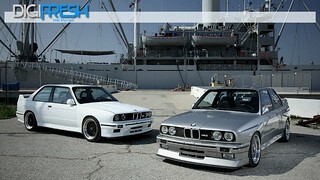 Besides I can get a super deal with a E28 ALT locally. Other thoughts are my alternator is mounted with delrin already, but I've read about solid mounting causing failures on track cars. My bnr was underdriven so I swapped the pulley. I would not run a solid mount alternator especially on a street car. The bracket design is weak enough as is. I suggest upgrading the engine and alternator grounds as well. Thanks. I should mention I'm using stock STEEL pulley's. Been down that road. Also a custom cut 316 stainless bracket; with all 12.9 hardware. It's been a good setup but the e28 alternator intrigues me for the next replacement. I've been running a 528e alternator for years. Just don't over tighten the belt. Thanks! Just ordered it today actually. We'll see how it goes. Interesting thing is that online and when pulled up alternator options there is TWO listed for our cars now. One is the typical version with bushings. Guess what the other one is lol. It's an overpriced "M" solid mount one. So ordered the one for the 1987 535i. Is the E28 alternator the same physical size? ie is it possible to put the field coils, stator etc into a bushed casing? E28 alternator came in. Looks identical to ours except has solid ears. If really want to looks like the housing could be swapped to save money and keep your bushed one. I put a caliper on the mount points and they are identical thickness. The last bushed alternator I had to grind off the ground stud that contacts the oil filter housing. Same with the E28 model you'll have to cut that stud off also. Ground hole just above the regulator is identical to ours and everything else exactly. No extra M cost on this one. I plan to swap my fan and pulley today. Then mount it up. I did a quick test fit and it's already a winner. Is the E28 part any different to the M20 alternator? I received one of those in exchange once (my mistake, should've returned it) and ran it for a few years until I got too worried about it and sourced a stock part. I think the same E28 alternator was listed to fit other models as well. I do remember seeing m20 e30 on there.